Leaf Guards for your rain gutters will protect your home from the worries of clogged gutters and water damage. Most people agree gutter cleaning is either number 1 or 2 or the list of things they wish they never had to do again. 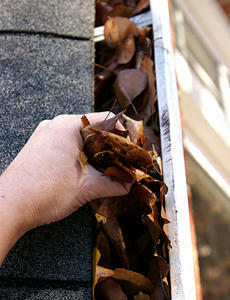 In fact every year hundreds of homeowners are killed from falls while cleaning out their gutters. Hundreds more are paralyzed. While still thousands more are injured… and the gutters still need to be cleaned year after year. A clogged gutter also serves as a breeding ground for insects including the West Nile Virus carrying mosquito. Clean gutters are the obvious solution, but keeping them clean year after year can be messy, costly and dangerous. Economical Leaf ProtectionE-Z-Lock™ is our most economical leaf protection product. It is a rigid steel mesh with a powder coating to prevent rust. E-Z-Lock™ is a very good product for properties with larger sized leaves (larger than a quarter) and debris.However, it does not work well for very small leaves, buds or pine needles. E-Z-Gutter’s steel screen products are made from .028 expanded galvanized steel that is powder-coated with proprietary powder formula for maximum durability. Except in areas where the roof line has concentrated water flow (such as an inside valley), water flowing off the roof does not shoot to the front of the gutter. It simply follows the roof line, on to the drip edge which is under the shingles, and down the back of the gutter. The reason that the water does not shoot to the front lip is that water clings to the surface it is flowing over. This is known as surface tension. Surface tension can best be visualized by slightly tipping a glass of water and watching the water run down the side of the glass.